I'm going to LOVE this, I can tell! Was this going to the Caltex place? Was this for the bus washing or to get the chatered busses? 90 minutes sounds like a TBC to me. Their cabbie didnt have enough fuel so they had to stop for it and Kapil was frustrated, it was on their way to the pitstop. Could be! We have an extra day and have been guessing an extended pitstop but TBC could be possible. I just kinda think they need some extra time...this next leg should have some really special scenery I think--I know I can't wait! Thanks for the nice words. But the real test is going to be the departure times next episode. So Peach, how do I go about watching this if, you know, I happen to decide to take a look? We'll tune you in Chateau...we hope to have a way to see it but sometimes it takes us a day or so...but don't worry, you'll know as soon as I do! Race:Drive a off-road buggy on a 8km course. Rice:Pound rice into paste and make into 2 rice balls. Under the pressures of the race, an unlikeable hero appears and its probably Tisha. Scene:Geoff and Tisha appear frustrated with each other. Ida:"Spider black behind us, the evil spider man." Henry and Bernie has a tiff. Henry:"You shouted at me all the time." Bernie:"I shouted at you because you were playing a fool." Natalie:"This is just the worst thing that could happen to us in the race." I'm already hunting for sources. I'll let you know, Chateau. WOW! an unlikeable hero or an unlikely hero?? 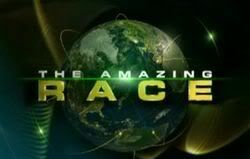 This is sounding like the toughest race ever---or else all those mactors just aren't so tough! hi guys, did you noticed something on about a Thai girl next beside to Allan Wu when she'd greeted to those 10 teams at the pit stop? Actually, she's Paula of the Team Thailand on TARA 2! Am I right?! That has been mentioned already. Neena & Amit will be chatting live between noon and 1 p.m. Singapore time, 1-2 p.m. in HK and that would be 1 -2 a.m. ET here in the States. You can head over to TARA's Windows Spaces Live page and chat with them then. So, a noon live chat in Singapore will be midnight in New York and noon in Hong Kong. Based on Chateau's times we can assume the first team arrived around 9ish AM. We know some teams (AD/Fuzzie and Geoff/Trish and another m/m team are seen at the airport on 5/22 at about 2 which would put them into Saigon in time to be seen at the Q-bar that night at 10ish. Apskip has some nice flights just upstream. I'm not going to get into another time zone argument with you. I was going on the time that was on the AXN website that the chat was at noon -1 SIN time and 1 - 2 p.m. HK time. Take it up with AXN. AXN is not making any representations in this thread and cannot be held accountable unlike contributors to this thread! The time zone information is not subject to any different interpretation by AXN or by any individual. It is what it is. However, one possible explanation is that there is a one hour chat for the Singapore audience and a separate one hour chat for the Hong Kong audience that indeed starts at 1am. If that's what you want to believe, more power to you. The first team to finish the task were brother and sister, Henry and Bernie, followed shortly by the Beauty Queens, Pailin and Natalie then by Geoff and Tisha. After a lot of puking, all teams finished with Niroo and Kapil, the father and son tandem being the last. After washing, teams must ride a bus right there at the station to Wat Pai Rong Hua. There are only three buses available and each bus will leave once three teams are already boarded (3rd bus will leave when the last 4 are done). Not reading the instructions carefully, Oliver and Mai hailed a cab to get to their next destination. When they realized their mistake, they went back to the Caltex station only to find out that the first bus had already left with Henry and Bernie, Neena and Amit and the Beauty Queens. Only a few minutes behind, Bus 2 carried Geoff and Natasha, Oliver and Mai and Ida and Tania. I'm pleased everyone seems to enjoy episode one. Those bugs! It was a real shock to the teams as we have started the first two series with a height challenge and I don't think anyone expected us to have an eating challenge off the top. The buses were huge and hard work, especially as the teams thought they were probably going to wash cars, since the clue referred to them as "vehicles". The Rice game was tough. It was hard work, really hot and there were lots of blisters. The Race detour was fun and a good choice for teams in my opinion. Teams will need to choose detours wisely this season or they will often pay a high price. And the first two seasons were non-eliminations in the first Leg but not this year. No let off this time around.